Runbox 7 heralds the beginning of a whole new web app experience for Runbox customers, and paves the way for future developments that include a dedicated mobile device app. 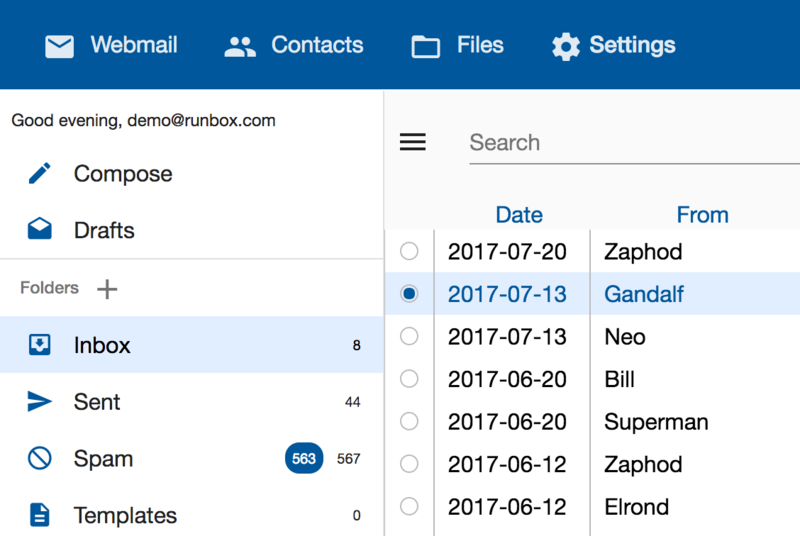 The Runbox 7 Webmail runs as an app in your browser and uses an account index stored on your device to provide message listing and search features. This makes Runbox 7 extremely fast in most browsers. Messages are listed without pagination in a window that scrolls as much as you need it to so that it can show all your messages. 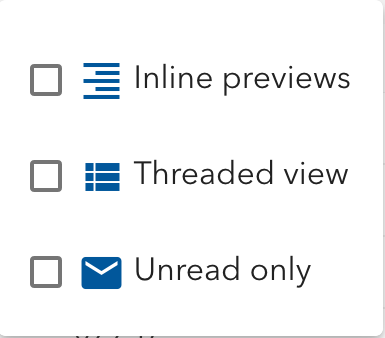 An often requested feature is also included in that the folders, message list and preview pane all scroll independently. You can also hide the folder list if you want more horizontal space for your messages. When you click on a message it is fetched from the server and shown in the preview pane. Click the button to the top right of the message list to show the drop-down menu with message list options. To show the first line of each message in between entries in the message list, select the “Inline previews” option in the drop-down menu. You can group incoming and outgoing messages according to their subject line in a message thread. To activate this feature choose the “Threaded” option available at the top right of the page. Note that this feature requires synchronization of the account index (see below). This option shows unread messages only. If you need to select more than one message click and drag the mouse over the radio buttons of the messages needed. Multiple selections can also be made by selecting a single or group of messages and then releasing the mouse and then clicking and dragging on other messages as needed. 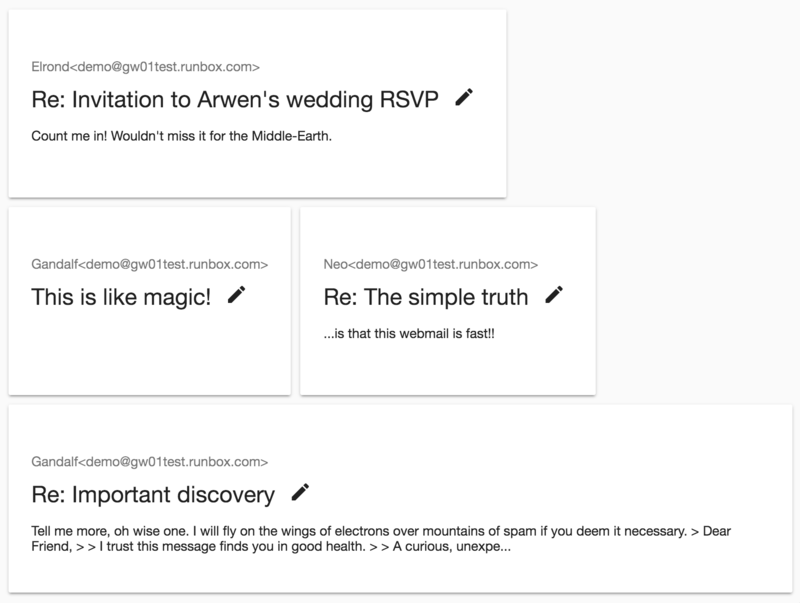 As you type in the search box at the top of the screen, Runbox 7 incrementally matches what you type with your message index until you have typed enough to find the message you are looking for. Not only is this fast due to the synchronized account index (see below), but as the search matches are shown as you type you will often find you see the message you need long before you have types your full search terms. This means you spend less time searching for messages, and you will also learn what sort of search terms yield the fastest results for the kind of searches you do. You can combine search terms using the Boolean search operators AND and OR, and you can specify which field to match by using for instance from:superman or subject:Earth. To limit the search to a folder, use e.g. folder:Inbox, noting that the folder name is case sensitive. To search in a sub folder, use the notation folder:Folder.Subfolder. An account index is pregenerated on the server and synchronized with your device when you first log in to your account. This provides an optimal and extremely fast webmail experience. If you choose not to allow the index to be downloaded for some reason then you will be served the messages from the central database and a server account index, which is somewhat slower. The account index is compact and doesn’t amount to anywhere near the size of your actual message content on the server. For example, we’ve seen account indices for a 6 GB account be less than 100 MB in size, and yet full search is available on the entire contents of the account. To stop index synchronization and delete the account index from your device, click “Stop index synchronization” at the bottom of the folder pane. If you previously selected to not synchronize the account index with your device, you can click “Synchronize index” at the bottom of the folder pane. 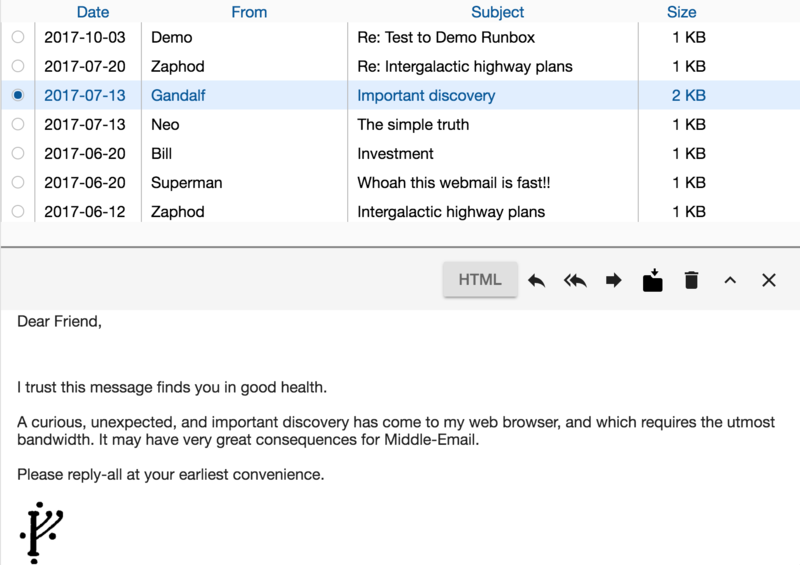 Runbox 7 brings a feature that has often been requested; auto updating of the Inbox for when new messages arrive. From now on the Inbox will update to show the current state of your messages including any new ones. Runbox 7 introduces a preview pane so that you don’t actually have to move from your message list to read or preview a message. Just clicking on a message will open a preview of that message. If you need to see the message in full just click on the “Full height” button. T he new Draft Desk shows your draft messages as “tiles’ that show a preview of the message content. You can easily find the message you want to continue working on and then open it to add more content. Recipient addresses are auto-completed as you type in the recipient fields, based on the email addresses found in the index for your account. Integration with Contacts is part of a later phase of the Runbox 7 development plan. The new Compose screen supports inline uploaded images. To insert an image from your device, first check the HTML box to switch to HTML editor mode (unless you have already done so). Then upload the image by dragging it onto the Compose area. Then click the Insert/Edit image button in the toolbar, and select the image from the Image List drop-down. Which browsers are supported by Runbox 7? All major browsers are supported, including Firefox, Edge, Safari, Chrome, and Opera. Internet Explorer is not supported because it does not support the technology used in Runbox 7, and has been discontinued by Microsoft in favor of Edge. Does searching work without the local index? Yes, the search feature will revert to using the message index on the server if there isn’t a local index, but it will be somewhat slower. Does the client need to download entire messages when adding to the search index? No – it only needs the relevant headers (from, to, subject, date etc) and the terms from the message content. Currently the text/plain part is transferred, but this can be reduced to terms only. What about low bandwidth clients, will they need to download all messages for indexing? No – the search index is cached on the client, so only new messages headers and terms will have to be downloaded. But what if the client doesn’t have any cached search index? If an index for your account for some reason isn’t available on the server, the client will by default create an index for the most recent 1000 messages. The client will offer an option to download relevant headers and terms for the entire or partial mail history. The size of this will be very similar to a pre-built index on the server. Oh my – why didn’t you plan this before boarding the ship? If you downloaded the index in advance, you could even search your email without having to be connected to that expensive net. OK — if you really need to search email from 5 years ago on the ship we do offer a fallback to sending a query to the server. Just choose not to synchronize the server index with your device, and you can still search all your email but it will be a bit slower. What if I don’t have 20MB of free space? Then you probably want to stick to the server-fallback as mentioned for the satellite 2G case. Does the new app work offline? Yes, the local search index does not require an internet connection, so you can search your email without being online. What about reading messages offline? We may offer an option to cache some messages to be available for reading offline. Does the new app require more bandwidth than the current Webmail? I’m using a public PC and I don’t want a search index left on that device. You should use a “Private browsing” mode when using public PCs, which prevents the index (and other data) from being stored on the local disk. If you forget to do so, just hit the “Remove local search index” button at the bottom of the folder pane, and it’s all gone from your device. Where is the search index stored on my device? The search index is stored as a persistent database in the browser’s IndexedDB location, which works as a normal filesystem unlike the browser’s cache. By using this database, the Runbox 7 Webmail app can re-use the index without having to download or generate it on each session. The location of IndexedDB depends on the browser you are using, but it is not part of the browser’s regular cache. Therefore it is not deleted when the browser’s cache is emptied — if you wish to delete the local index, click the “Remove local search index” button at the bottom of the folder pane. Is it safe to store the search index locally? Whenever you visit a website, your browser will cache data locally unless it’s in “Private browsing” mode. The search index is stored outside of the browser’s cache, but inside the directory that contains the application data for the current user profile. When using a personal computer, you may choose to encrypt your data storage which will protect any locally stored data. If you are using a public access computer, the cache and other downloaded data is removed when you log out of the session (which you should always do). You can click the “Remove local search index” button at the bottom of the folder pane before logging out of Runbox 7 to ensure that the search index is deleted.